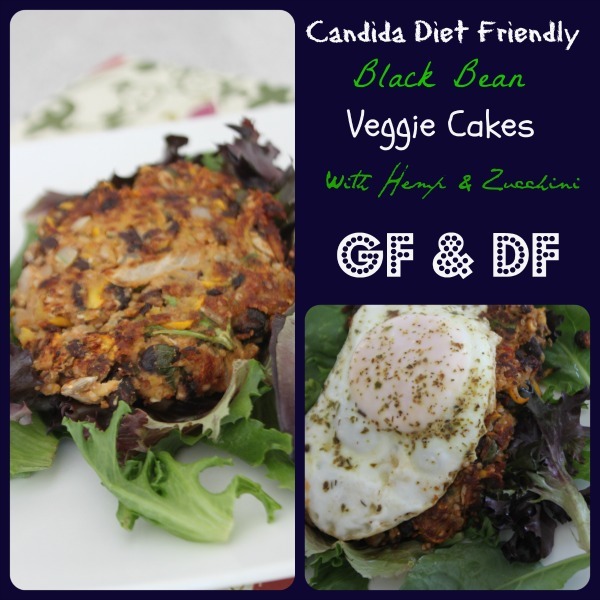 I served these black bean cakes on a bed of lettuce topped with a basted egg sprinkled with oregano. So delicious! As you may know I'm on the Candida diet. Have been for some time. Prior to the Candida diet I followed a mostly Paleo, grain free diet that didn't generally include beans, except for green beans. But this Candida diet is very restrictive and I'm hungry all the time. And I'm allowed to eat a modest amount of black beans due to their low net carbohydrates and low glycemic index. So I first dabbled back into beans with my BLOW YOUR MIND BLACK BEAN BROWNIES. Those are seriously amazing. And I seemed to handle them okay. Which I can't say for most grains I have tried to dabble back into. So I decided to try another stab at a black bean dish. And it was really good. These black bean patties are full of fiber and nutrients. They are dairy and wheat free. And they are vegan if you skip the egg on top. A very clean and delicious lunch or breakfast. Or breakfast-supper as my girls like to call it when we have pancakes or smoothies for supper. I really enjoyed these and will be making them again. And I really like that you can make them ahead of time and just fry them up quickly for a fast meal. Black beans are pretty awesome. Who knew............well now I do. And hopefully you will too! Add all the ingredients together in a mixing bowl and then mash until the beans are about 50% mashed. Let it sit for about 10 minutes until the coconut flour has a chance to absorb some of the liquid. Fry over medium heat in a frying pan in a generous amount of organic extra virgin olive oil or coconut oil. Fry each side for about 3 - 4 minutes until crisp. Serve with a fried egg, salsa or toppings of your choice.